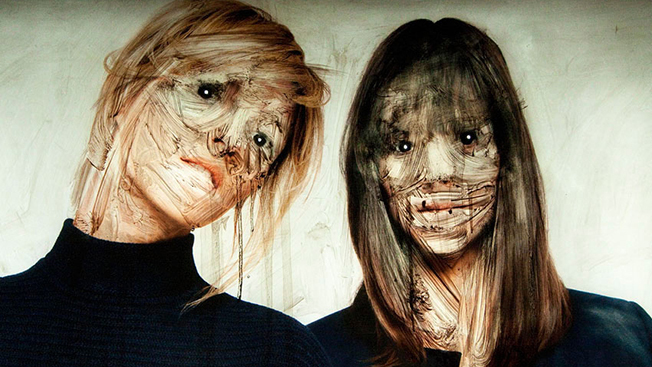 As if the Photoshop-perfect faces on outdoor ads weren't nightmarish enough, German street artist Vermibus ratchets up the horror by using chemicals to transform such posters into grotesque visions for an art project called "Dissolving Europe." This guy's acid wash has nothing to do with jeans. He targets noses, lips, cheeks, chins, ears and eyes. By the time he's done, his subjects resemble nuclear-blast victims, their features twisted into misshapen parodies of the human form. Of course, "ugly" is in the eye of the beholder. Some will find his creations possessed of a certain warped beauty that exposes the truth underlying our pervasive consumer culture. That's a valid interpretation, and it's clearly in line with the artist's view as he traversed Europe, removing promotional posters from their displays and replacing them with his freakish creations. (You can view more of his projects on his website.) A 10-minute film chronicles his journey, and it's fairly hypnotic. The best scene shows Vermibus wearing a gas mask to protect himself from toxins, like some hybrid artist/terrorist, as he defaces/transforms an advertisement. Of late, there have been many examples of public advertising being replaced or subverted to make broader social statements. There's Banksy, of course, railing against capitalism. And those fake ads about NYPD drones. Outdoor ads were swapped out for classic paintings in recent French and English installations. And Richard Sargent's photographs of decaying billboards in California were especially evocative. Ultimately and unfortunately, these efforts become footnotes on the overloaded media landscape. They're fodder for thoughtful articles and blog posts, but all too quickly forgotten. Billboards brake for no one. Ad campaigns keep coming. There's always another pretty face. Photos and artwork via Vermibus.com.